1) There is very little on television at 3:00 a.m. in the morning in the U.S. . I've found this also to be the case in Germany and Japan. Someone needs to create the "JetLag Channel" for international travellers that will have non-infomercial programming on at odd hours of the night. 2) We get an incredible amount of junk mail. We haven't been gone all that long, and still going through all the junk mail took quite a bit of time. You might think that after the first dozen credit card offers went unanswered, they might not send you another three or four dozen - but that is not the case. Adding up the combined value of the credit cards and home equity lines of credit, I think we were offered enough money since we were gone to purchase a small nation. 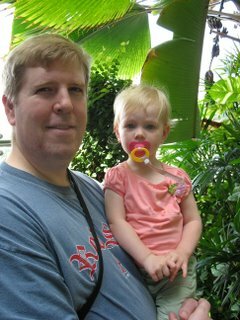 3) While it was very enjoyable to drive along the Charles River, enjoy a Coffee Coolatta, sleep on a normal pillow, and walk through a grocery store with a shopping cart without feeling like you are threading a needle - being home is not much fun without your family. I flew on Thursday to New Jersey for final presentations for two projects. My job is to develop marketing strategies for pharmaceuticals; answering questions such as : what are the needs in the marketplace?, what messages should you use to try and find a niche for your product?, what are the key competitors?, what should your pricing strategy be?, etc., etc. Our first presentation on Friday was to share our strategic vision for a particular pharmaceutical product. We had worked on this project for about 3-4 months or so. We set up in the conference room, hooked up the LCD projector, put up the title slide of our presentation, and waited for the brand team to arrive. When the head of the brand team came into the room, he sat down and said "I just came from a regulatory meeting with the clinical team. Evidently, it looks like this drug is not going to be approved." So, we turned off the projector, closed our laptops, and ended the meeting. Shortest final presentation ever. I have to admit I'm a bit of a Diet Coke addict. Not a 12 cans a day type addict, but usually about 12-15 cans per week - which is still a pretty fair amount. One day while enjoying a cold Diet Coke, SJ asked me for a sip. I innocently enough gave her a taste, and a would-be addict was born. So now, I can never drink Coke in the house without giving SJ her own cup with a few tablespoons of the sweet, dark liquid. 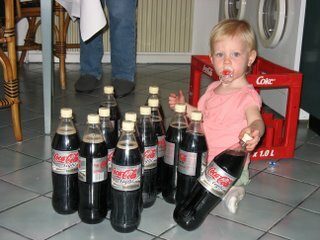 Not only that, it is not uncommon for SJ to wake up in the morning and immediately ask for "a sip of Coke?". Nature or nurture, you decide. 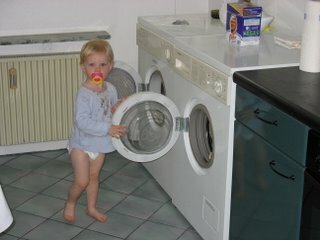 Since we've been in Germany, SJ has discovered the "joy" of laundry. She really likes putting the dirty clothes in the washing machine and tranferring the clean clothes from the washing machine to the dryer. 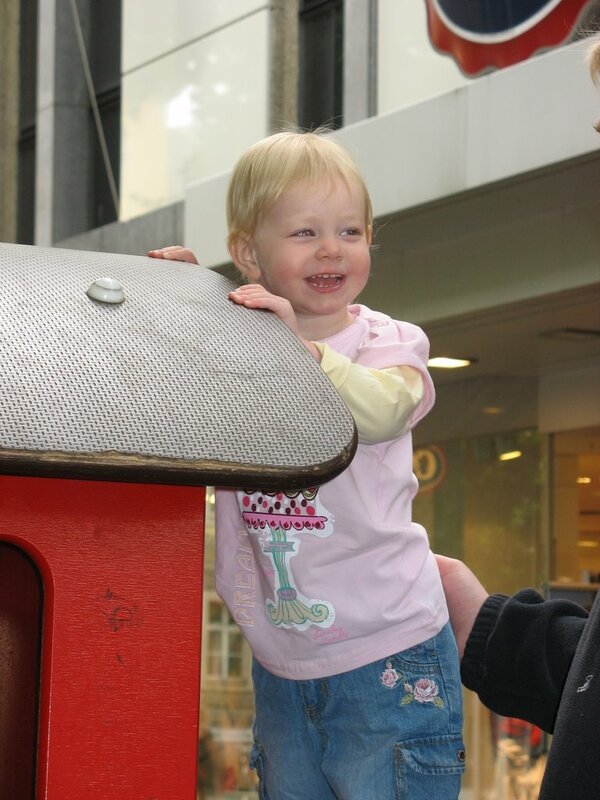 On this occasion, she put all the clothes in the dryer all by herself. What a little helper! 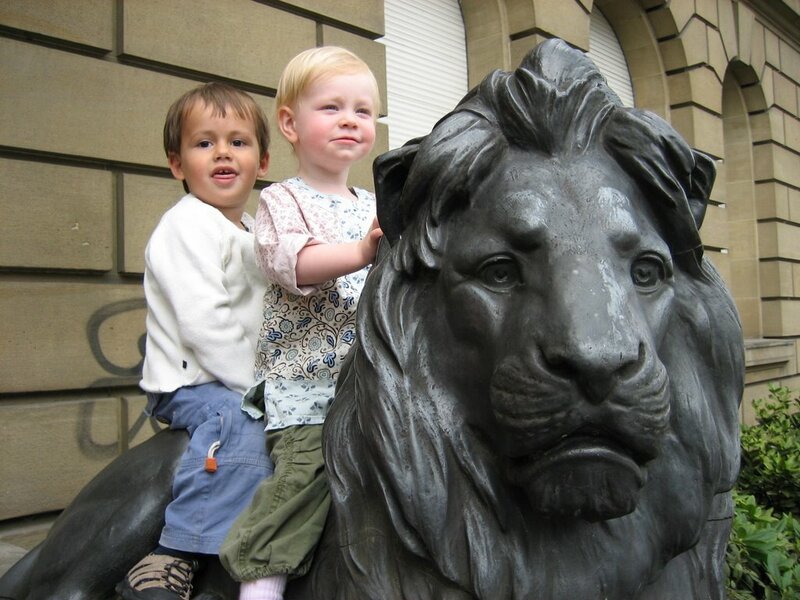 Unfortunately, this week we found out that SJ's best friend, Tomas, will be leaving Bonn as of this Friday. He may still come back in a month, but that is unclear at this point. Tomorrow I'm heading back to the States for a whirlwind tour of Newark, NJ, and Boston. Barring any airline delay disasters, I will have the opportunity to sleep in my own bed for a few hours - before getting up to start packing up diapers, Cheerios, and a few other things to import back into Germany. Included in that list of imports will be SJ's grandparents, who coincidentally, will be on the same flight back to Cologne as I will. They will be joining us for a 2 week stay. The first week, SJ will give them a special tour of Bonn she refers to as "SJ's Germany". 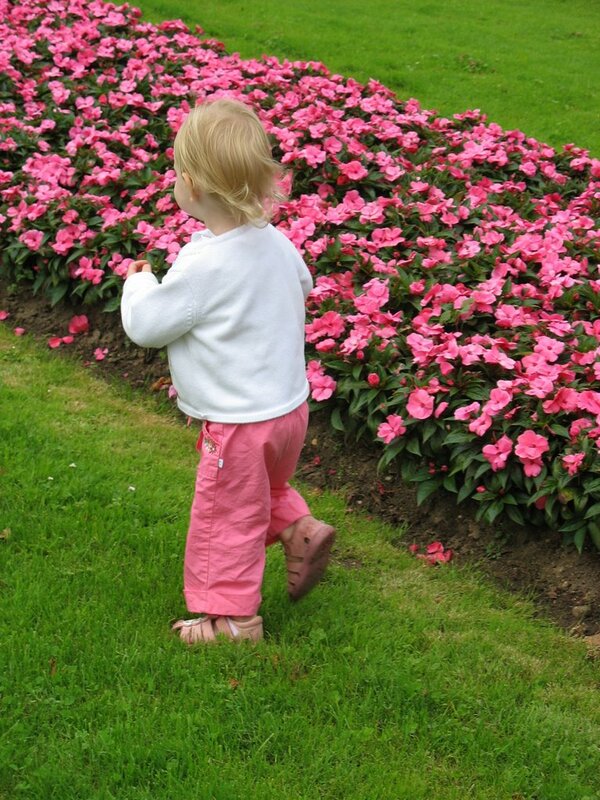 Trips to the park. Ice cream. Rosinenbroetchen. Naps. The Pedestrian Zone. Etc. The second week, all of us will head out for a trip to Berlin, then on to Salzburg, and then back to Bonn. Saturday afternoon we headed out with SJ's friend, Tomase, and his parents to one of the partner's house for a BBQ. The weather reports had been rather foreboding for days, but it actually ended up being a really nice afternoon without a drop of rain. 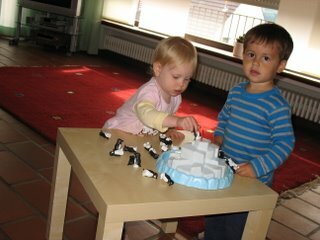 Here SJ and Tomase played a game of Penguins. I think they developed their set of 'house rules' for the game, which basically meant they set the penguins up and then knocked them down. As has been typical for Germany, SJ loved the Bratwurst grilled on the grill, in addition to some grilled pork. 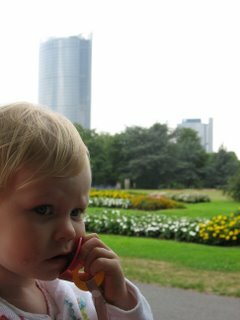 However, in what was a new discovery, she also really likes gerkin pickles. She ate about 5-6 pickles at dinner, which is quite a bit for a little girl. I think few things are idealicized about Germany more than "The Autobahn". From watching car commercials, one would think the autobahn is basically the world's ultimate driving experience - a single lane highway snaking around curves, beautiful vistas, that you can drive at whatever speed your heart can take. The reality is far from the ideal, however. For one thing, the German highway system is extremely crowded. Most highways have only two lanes in each direction, and they are incredibly clogged with trucks. Very frequently the highways get stuck in horrendous traffic jams, where people sit for hours stuck in traffic. The other thing is that you very often have speed limits. That's not the case everywhere, but it seems to be pretty common around metropolitan areas. This past week I had my first business meeting in Germany, and it was about a 2 hour drive from the office. I went with the president of the company, and he asked me if I wanted to drive, but I decided to pass. I felt that driving the president's Mercedes, on the autobahn, in rush hour traffic would be a little too stressful for my first driving experience in Germany. If I had driven, it would have taken us twice as long - as there is no way I would have felt disregarding the speed limit as often as he did. BTW, 220 km per hour feels really fast. Sunday evening we took a bus ride to a park about 30 minutes away from our place called the Waldau. The park had a huge playground, actually more like 6 playgrounds joined together, and SJ had a lot of fun. The park also has a couple of large fenced in fields with animals, so SJ had an opportunity to feed the deer. 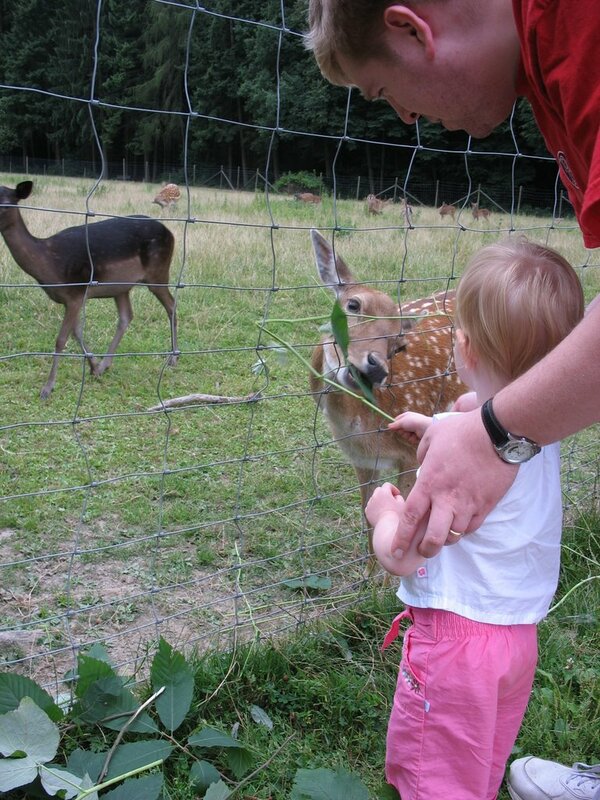 This was a blast for her, except that she kept wanting to give the deer an individual leaf out of her hand - and I was fearful that she might get accidentally bitten. It was a great place, and one we certainly hope to return to soon. This past Saturday, we had the ultimate missed photo opportunity. There was a wedding taking place at the Rathaus (yes, that really is the name for city hall in German) and as the bride and groom came out the released dozens of red balloons in the air. So, here we are, walking through Germany, and up in the air we see 99 red ballons go by. 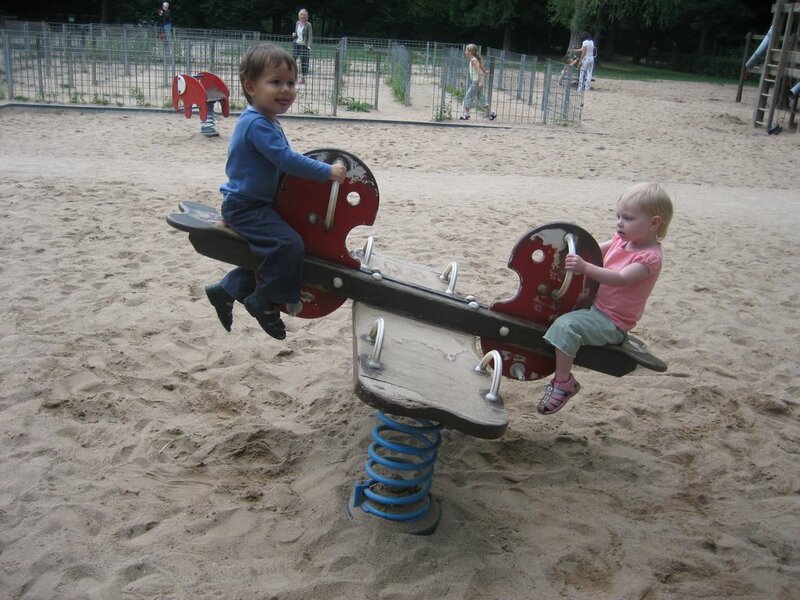 A playground for that kid in the Matrix Reloaded. Bonn was the capital of West Germany from 1949 to 1990. It is actually only the 19th largest city in Germany, so it may seem to be a strange choice for the capital. However, it was chosen as the capital because many West Germans were hoping for the eventual reunification of the country and being able to reclaim Berlin as the capital once again - which is of course what eventually happened. 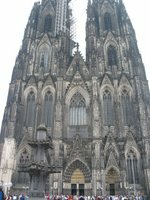 It was felt that if one of the larger cities - Cologne, Munich, etc., - was the "interim capital" that it would be harder to move the capital back to Berlin. Of course in the 40 years that Bonn was the capital a significant amount of "industry" was built up in the region related to the government. In addition to all the government employees, there were also all the embassies from other nations. When the government moved back to Berlin, it was feared that moving tens of thousands of people out of Bonn would devastate the local economy. So, they decided to keep the headquarters of Deutsche Post (the postal service) in Bonn, as well as relocate some functions of the United Nations to Bonn. In the background of the picture you can see the Deutsche Post building, and the UN buidling which I believe is the part of the former campus of the West German government. Horticulturalists may object that these are not tulips, but the alliteration is too good to pass up. We paused near the waterfall in the Japanese Garden for a photo op with SJ and her Mom. 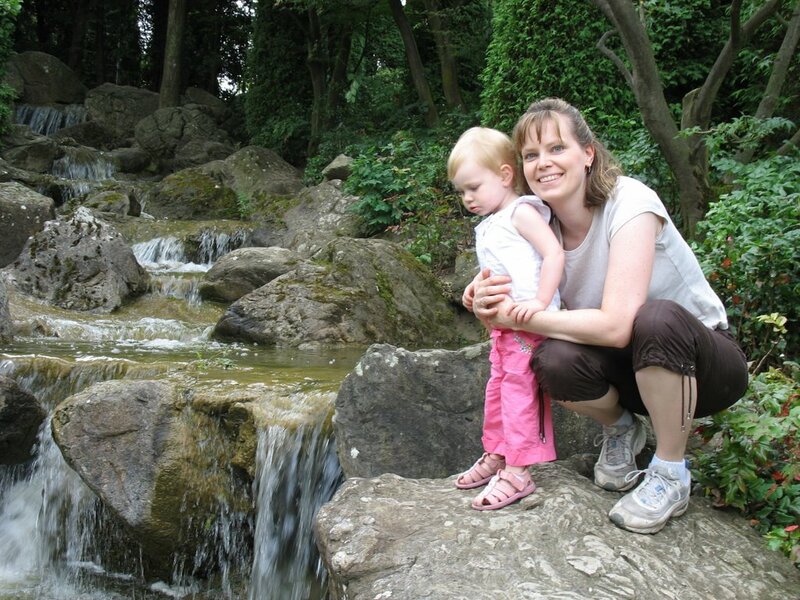 We had to leave shortly after this photo was taken, unfortunately, as SJ decided that jumping in the water was the absolutely most important thing in the world that she had to do. 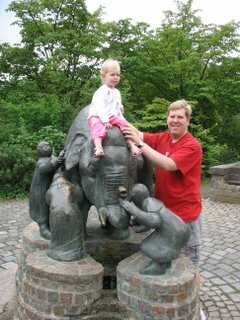 We strolled into the Japanese Garden in the Rheinaue, with SJ pausing for a photo op on a statue of an elephant. 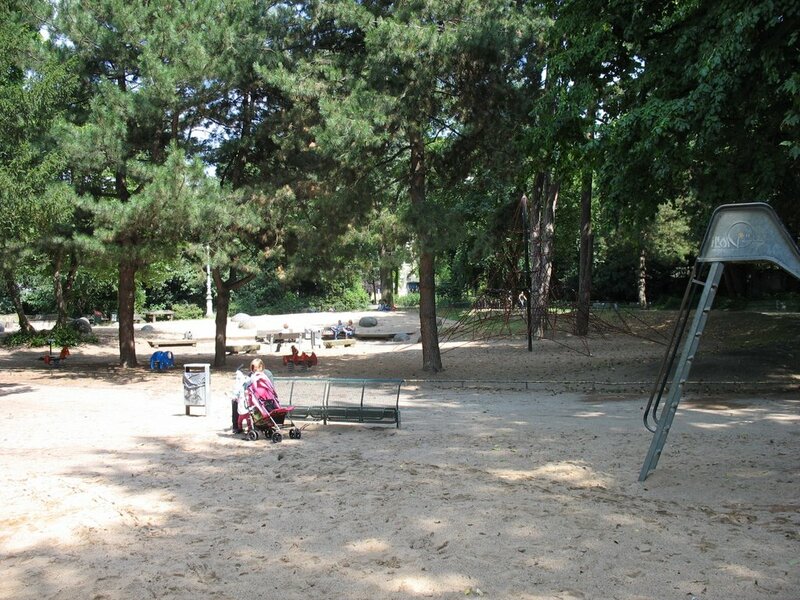 On Sunday we headed back to the Rheinaue, which is a great place to spend the day. The Rheinaue is a fairly expansive public park along the Rhein, with lakes, paths, a Japanese garden, some strange sculptures, and a nice outdoor cafe. 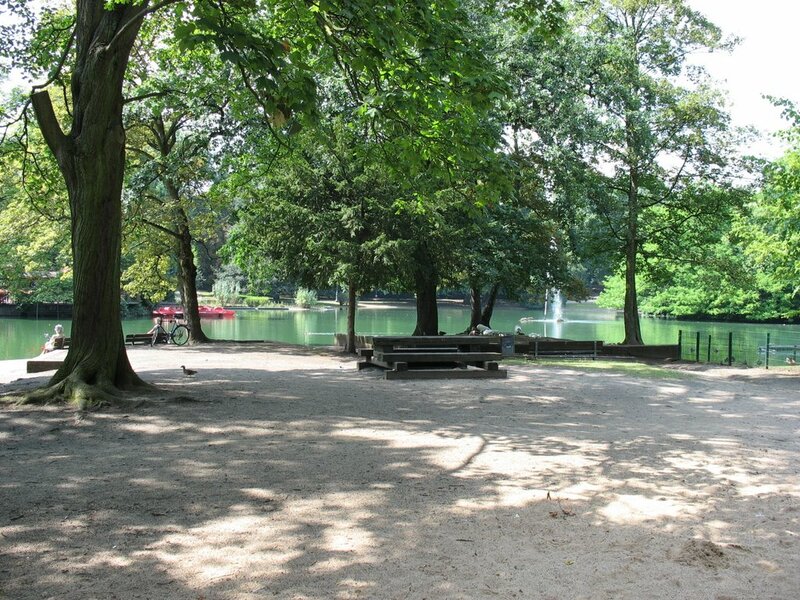 So, we had brunch at the cafe and then went for a long stroll through the park. In the U.S. there is a company called ZipCar which sells hourly car rentals. They have rental cars parked at various places throughout Boston, and if you want to rent the car for a few hours, you just go and pick one up, and then return it later on. In Cologne, DeutscheBonn has a similar business model, but with bikes. These bikes are just parked throughout the city, and they have a phone number on the bike for you to call and rent the bike. After you call, they send a signal to the bike that unlocks the pedals. Pretty nifty. Gleis 7. 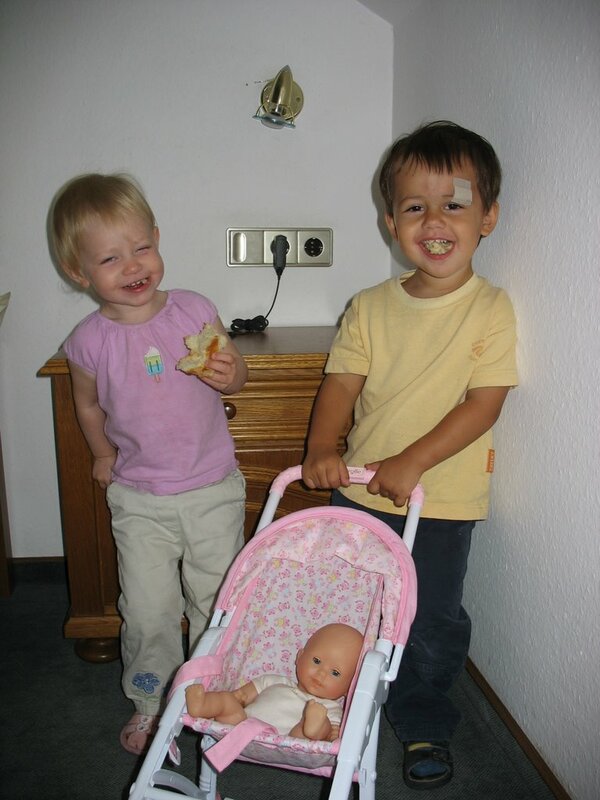 Nein, Gleis 9. Nein, Gleis 7. My high school German teach used to talk about how German trains were always on time. After living in Germany for a month and a half, I can tell you that is not true. Certainly not all trains. There are two train systems in Germany. There are the high speed intercity trains, and those generally run on time. And then there are the regional trains, somewhat akin to the commuter rail back in Boston, and those trains are very frequently late. 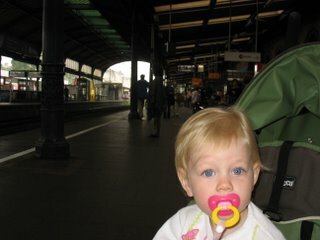 After passing through the mob to the get to the Cologne trainstation, we managed to pick out a train back to Bonn. The train station in Cologne is incredibly busy. Some 1,200 trains pass through there every day. The previous train leaving for Bonn was already 45 minutes late, and still hadn't arrived. So, we looked on the departure list and headed to track 7. SJ was already pretty tired, so she was in her stroller and we decided to just carry her up the stairs to the platform since we didn't see any elevators. The subway stations in Cologne all had elevators, but it seemed they also doubled as public urinals - as evidenced by the smell - so we didn't look too hard for an elevator in the train station. So after climbing the stairs with the stroller we were waiting on track 7 when they made the announcement "We're sorry, but the train to Bonn will instead be arriving on Track 9". So, we picked up SJ in her stroller, carried her down the stairs, over the track 9, and back up the stairs to track 9. Pretty much the exact second that her stroller touched down we hear "We're sorry, but the train to Bonn will instead be arriving on Track 7". Before we even had a chance to try and decide whether we could again carry her down and back up the stairs, we see the train indeed arriving two platforms over on Track 7. So, we - along with everyone else who wanted to go to Bonn - decided there was no way to make that train. So, we waited for the next one. Unfortunately, this meant that there were ALOT of people wanting to get on the next train, which was already quite late itself. When the train finally did pull up, there were no seats to be had. I don't know what the exact rules of chivalry are, but if an adult male is carrying a 2 year old girl, shouldn't someone offer him a seat for the little girl? Evidently not. So, it was a bit a rough trip home from Cologne, but we were still glad for the adventure. After leaving the Volksgarten, we took the tram back to the pedestrian zone. Unfortunately, it was now late afternoon and the pedestrian zone was absolutely packed. I've since been told that overcrowding is a serious problem in Cologne on Saturdays. During the holidays, they actually close off the pedestrian zone and set up barricades so that too many people don't go in. They wait for 30 people to leave, and then they let 30 people in. So, I don't think we'll be going to Cologne during the holidays on a Saturday. It felt pretty much like Times Square, with wall to wall people. We had wanted to look at some clothes for SJ (there are actually four H&M stores in the pedestrian zone in Cologne), but everything was just too packed. I had also hoped to visit the Dunkin Donuts store for a 'Coffee Coolatta' (Cologne has the only DD around), but you couldn't get in the store as it was too crowded. So, we decided to just go home and tried to make our way to the train station. Just as we hit the last stretch, our path was blocked by a "Down with Israel & the U.S." parade. Real fun. The parade was quite long, and we were quite ready to leave, so we had no choice but to wait for an opening and push the stroller through the throngs of angry Arabs. Ahh...the memories. 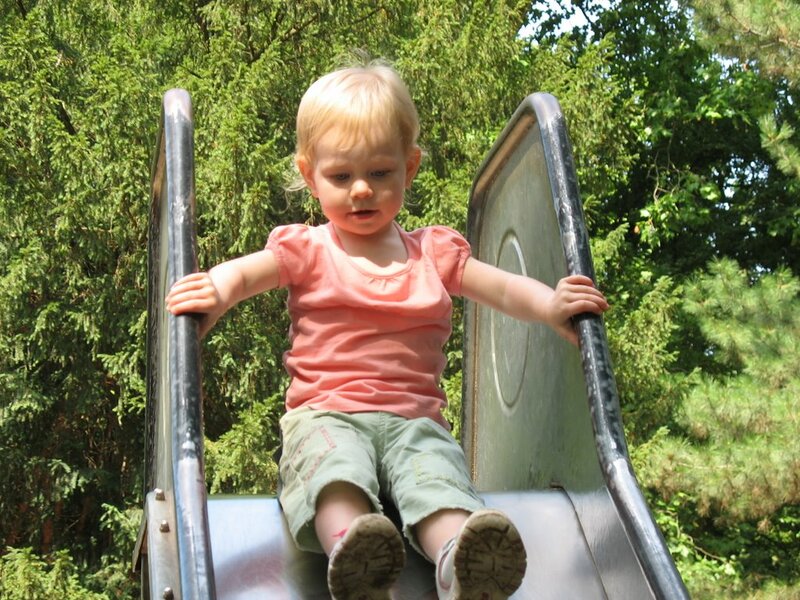 The playground in the Volksgarten had a really big slide, and SJ decided that she wanted to go down it all by herself. I was a little skeptical, but she's a pretty independent little girl. 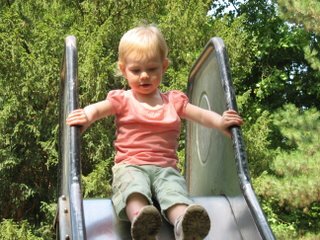 So, she climbed up the ladder to the slide - all by herself (with a little unobtrusive spotting) - and went down the slide with great glee. Immediately upon hitting the ground she ran back around to go up again. 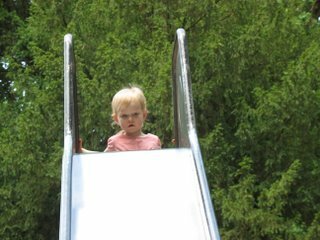 She went up and down 5-6 times, pausing only when a little boy on the playground had the audacity to look at the slide and think about using it. "No, MINE!" Shouted SJ. Ah well, learning to share is a slow process. 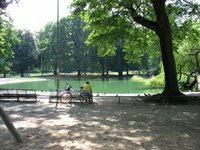 After lunch, we hopped on the tram (using our all day pass) and headed to the Volksgarten, a park in the SE corner of Cologne. 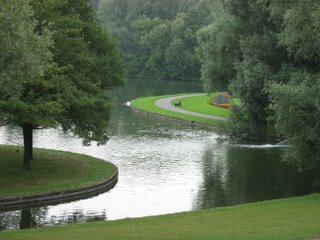 It was a fairly nice park, although not quite as well kept as some of the others we'd been to in Germany. 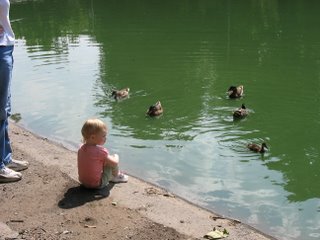 There was a pretty good sized playground, a pond, and some nice walking trails. There was a stand with paddleboats, but for some reason it was closed. 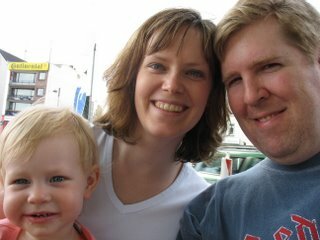 After a delicious lunch, the fam pauses for a self portrait. 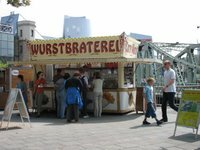 After the visit to the Chocolate Museum, we enjoyed what could be described as the German equivalent of a hot dog or hamburger. 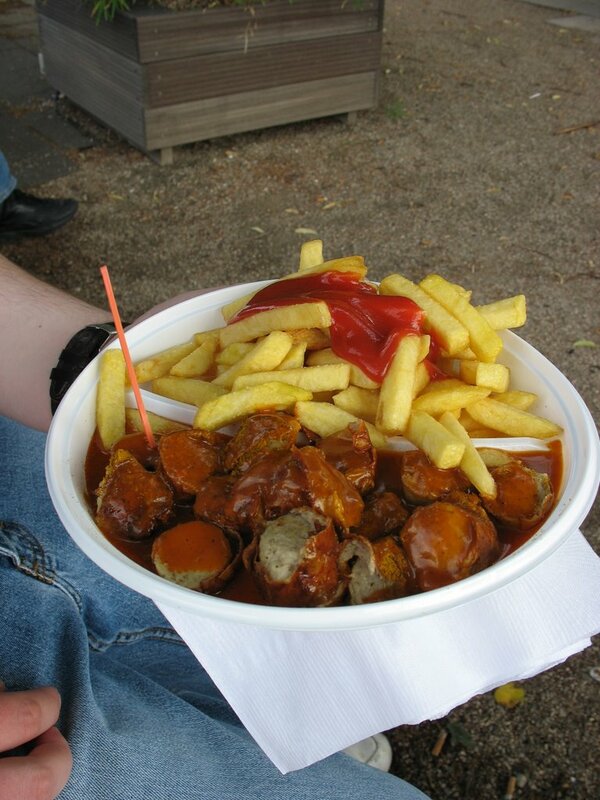 Currywurst and french fries are pretty much the ubiquitous fast food around here. They take a sausage, cut it up in this dicing machine, sprinkle curry powder over it, and then douse it in curry sauce and serve it with a tiny plastic fork. It's actually pretty tasty, and even SJ likes it. Although that isn't too surprising since we've found that SJ likes meat in Germany quite a bit. We could never get her to eat meat in the States. She would even spit out pieces of ground beef in spaghetti sauce. But, she seems to be a big fan of German sausage, German bologna, and will even eat straight ground beef. Who can understand kids? 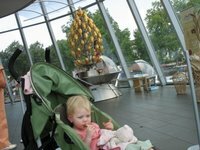 The Chocolate Museum had a miniature rain forest to simulate the conditions for growing cocoa trees. Inside the greenhouse, they keep the conditions at about 85% humidity and 85 degrees Fahrenheit. 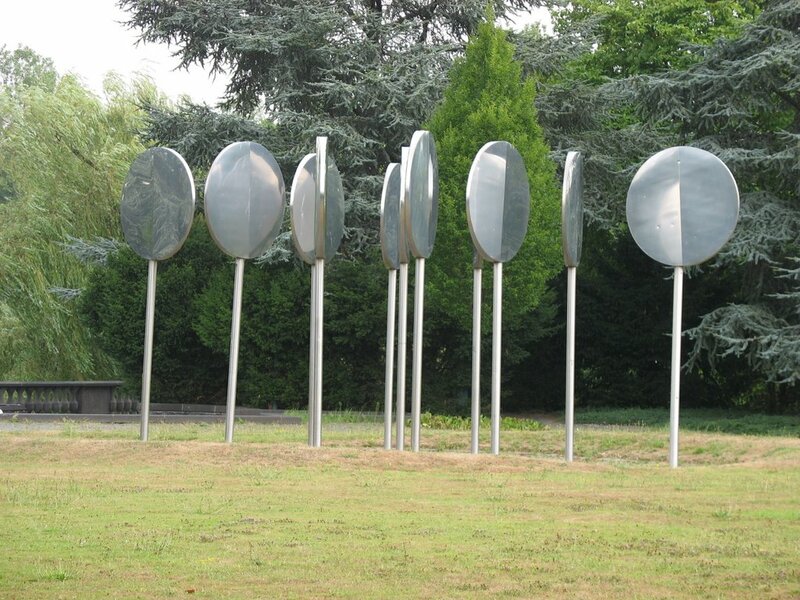 It reminded us of our first few weeks in Bonn. Here SJ enjoys a wafer dipped in molten chocolate from the chocolate tree at the Chocolate Museum. 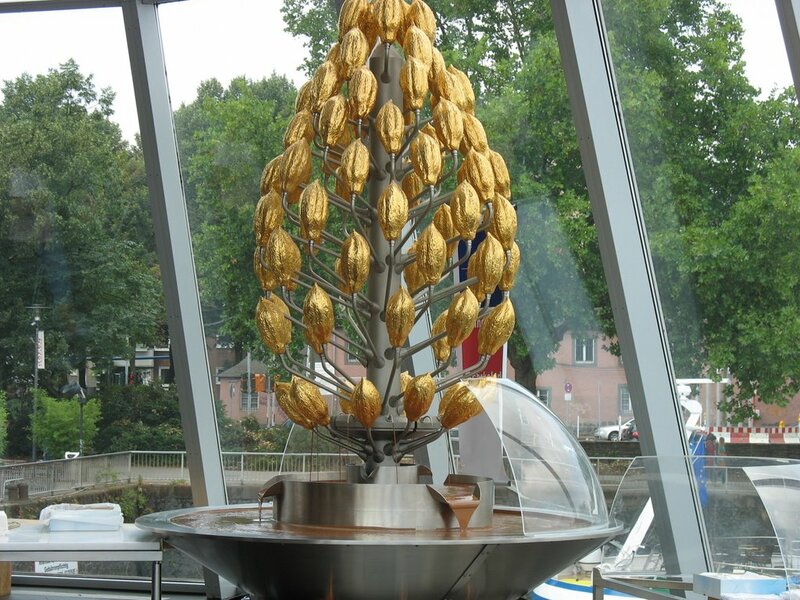 One of the interesting things about the chocolate museum is that they actually produce chocolate there, so as you walk around and see the different machines they are actually making edible chocolate - which is different from the chocolate museum in Hershey, PA, for example. 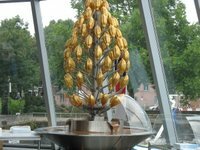 After visiting the cathedral, we walked through the pedestrian zone down to the river and over to the Lindt Chocolate Museum. 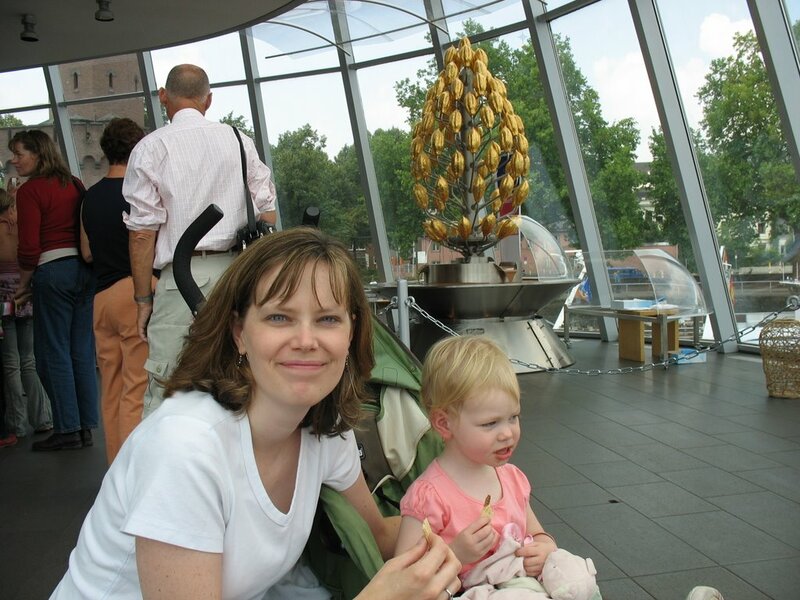 SJ had fallen asleep by this point, so we had the chance to go through the museum and actually read the exhibits on the complex process of making chocolate, and some of the history of chocolate making. It was pretty interesting stuff, I must say. I had no idea how many steps were involved in producing chocolate. 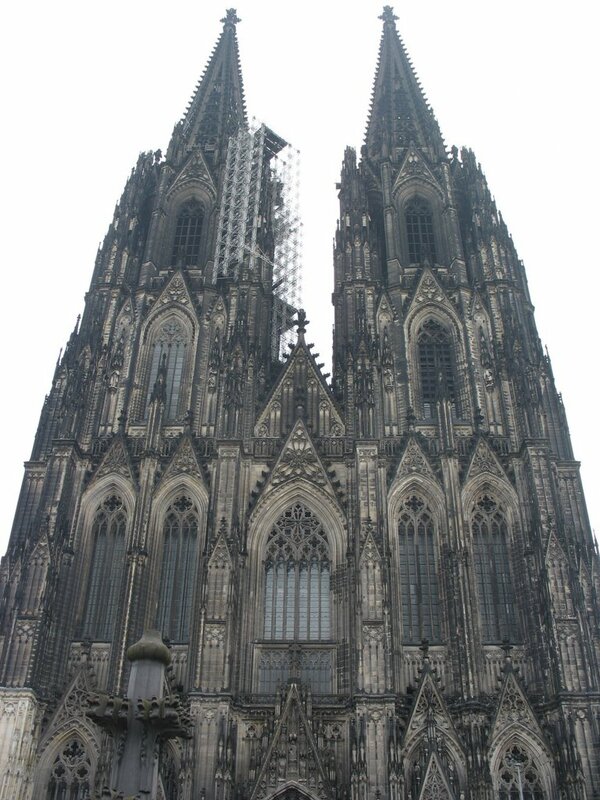 The Cathedral in Cologne is it's most famous site. It is the largest cathedral in Germany, and it certainly is an impressive sight. I thought it was really interesting that it took 600 years to finish. People in Boston feel like the 'Big Dig' has been going on forever, and that's only 20 years old. 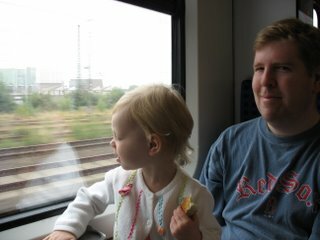 Here we are on the way to Cologne, while SJ enjoys her morning Rosinenbroetchen. Once we got on the train, it was a nice trip. Unfortunately, it took us an hour at the train station before we could get on the train. The pricing for the train system here is incredibly confusing. There are all these different levels of discount cards you can buy, different prices for different regions, times of the week, etc. 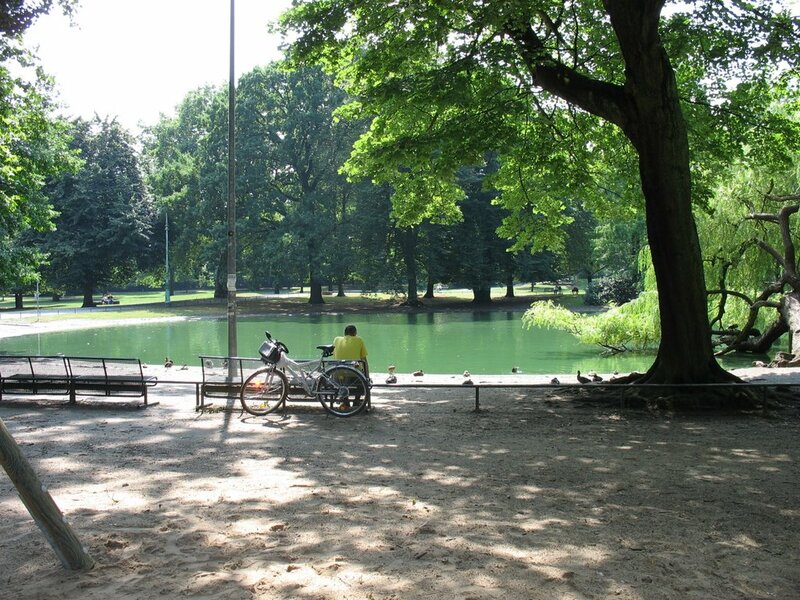 For example, we wanted to go from Bonn to Cologne, which is 12 Euros round trip for an adult. Easy enough. 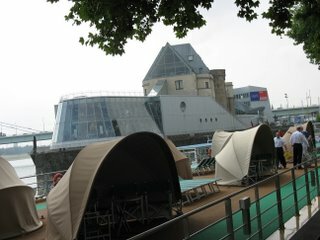 But, the person at the information booth told us that the all-day pass (including subway) was 17 Euros for 5 people. We thought they were trying to tell us that for 5 Euros more, we could get all day subway added on to our round trip ticket, and we weren't interested in that. Eventually, we were able to figure out that for 17 Euros up to 5 people can travel all they want between Bonn and Cologne, and have unlimited travel on the bus and subway. Which is quite a deal, so we decided to get that. At least that's what I hope the offer was for. 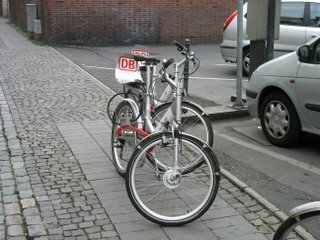 Unlike the U.S., where you can't get on public transportation without a ticket, the public transportation in Germany works on the semi-honor system. Everyone is supposed to buy a ticket before you get on the train/bus/subway, but anyone can just walk on without paying. In order to prevent this from happening all the time, they have these students that randomly check people for tickets. In the 5 weeks that we've been here, we've taken public transport at least a few dozen times, and we've seen a ticket checker only once. Supposedly if you get caught something really bad happens, but I'm really curious what percentage of people actually buy tickets. After we figured out what we were supposed to buy, we went to the automated machine to purchase our ticket. Unfortunately, this is when we ran into our second problem. The machine said that it accepted 50 Euro bills (which is all we had), but it didn't seem to want to accept 50 Euro bills on this particular day. Nor did any of the other machines. And they of course don't take credit cards. Germany is somewhat of a cash only economy, which is interesting, because although a lot of places only take cash, they often seem annoyed if you have anything but exact change. I was at the bakery the other day and the fellow in front of me purchased about E 2.50 in goods and gave them a 5 Euro bill. The baker huffed and puffed and asked if they didn't have anything smaller. I knew I was in trouble because all I was carrying was a 10 Euro bill. As you could foresee, the baker was doubly upset when I had the audacity to present a 10 Euro bill in exchange for about E 2.50 in goods. Maybe I need to break down and start carrying around a change purse. So, here we are in the train station, trying to buy a 17 Euro train ticket, but they won't take our 50 Euro bill. I briefly thought about going into the convenience store to buy something, but I knew that if I purchased anything less than 49 Euros worth of tic tacs, I was going to get yelled at. There was actually a bank at the train station, and I thought that might be a solution, so I went and stood in line. Unfortunately, the line didn't move at all for about 15 minutes, so I gave up. Evidently there was some Nigerian prince at the front of the line trying to wire money to the U.S. and it was taking awhile. Eventually, we found a place where you could buy tickets from an actual human being, instead of the automated machines. The line took quite a while, since I imagine most of the people in the line were non-Germans who were completely befuddled as to what they were supposed to buy, but eventually we got our ticket and boarded the train. This past weekend was somewhat of a turning point for us. For our first few weeks here, it was just about all we could do to try and find things to eat, figure out some way to keep cool, and figure out how to coaxe SJ to go to sleep. However, after three weeks (and a change in the weather) it seems we have finally taken care of all of our basic needs. We know how to get food, we know how to throw away our trash (definitely worthy of a post at some point), our internet seems to be working consistently, and SJ is finally getting to bed on a consistent basis. So, last weekend we actually found ourselves to be....well...bored. While living on a subsistence level is not great in many ways, it can be a little exciting. Or at least it is busy enough to prevent you from getting bored. So, last weekend we decided that we were going to make sure and go somewhere or do something this weekend. 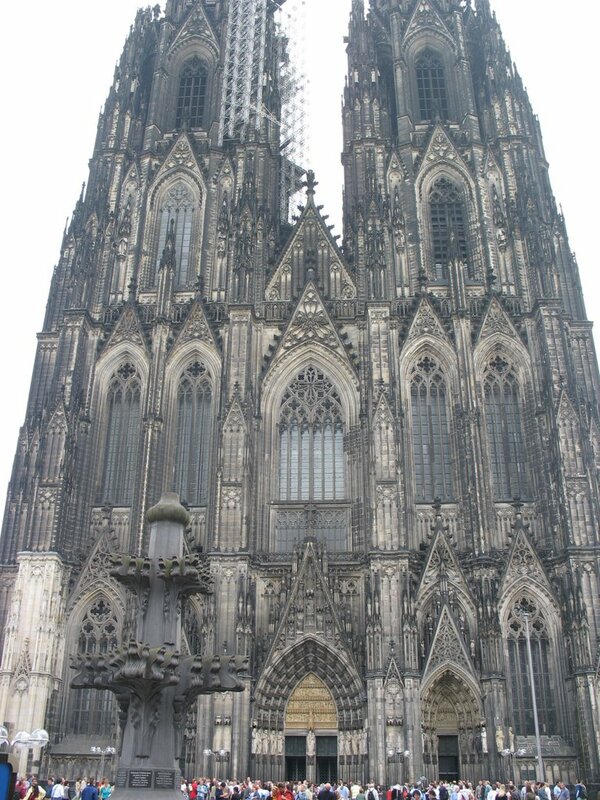 Cologne was an obvious choice, since it is Germany's fourth largest city and within a 30 minute train ride from Bonn. So, it's off to Cologne we go! There's something really special about sharing a meal with friends. 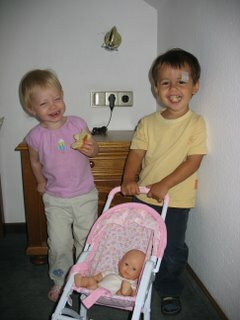 Here SJ shares two of her most favorite things in the world - her stroller and Rosinenbroetchen - with her friend Tomas. 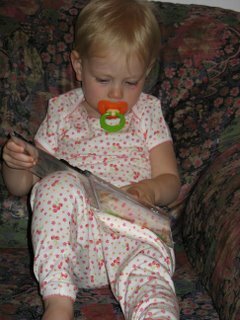 Here SJ studies up on the German lyrics to her new CD, Unser Apfelhaus, in her new PJs. 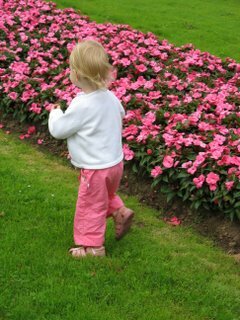 A few minutes after this picture was taken, SJ was spinning around and dancing to 'Brüderchen komm tanz mit mir' and having a merry old time. Unfortunately, it's rather difficult to get a good picture of a leaping SJ - so you'll just have to take my word for it. We picked up SJ's PJ's at the infamous 'Schumann Strasse' post office. Thankfully, the Schumann Strasse branch is within easy walking distance of our flat, so no treks on public transportation today. The funny thing is, when we presented our package slip in Schumann Strasse, they immediately tried to send us back to Kessenich. "Nein, nein. The package ist hier", we replied. "Nein, Kessenich" she huffed. After considerable protest, they eventually consented to look and see if the package was indeed in Schumann Strasse, and it was. So, SJ got to go to bed in her brand new PJ's - which was quite a thrill. Immediately after opening the package she started to put them on - over her existing clothes. As has been mentioned in this space before, July was a really hot month in Bonn. This did not make it any easier adjusting to life in Germany. 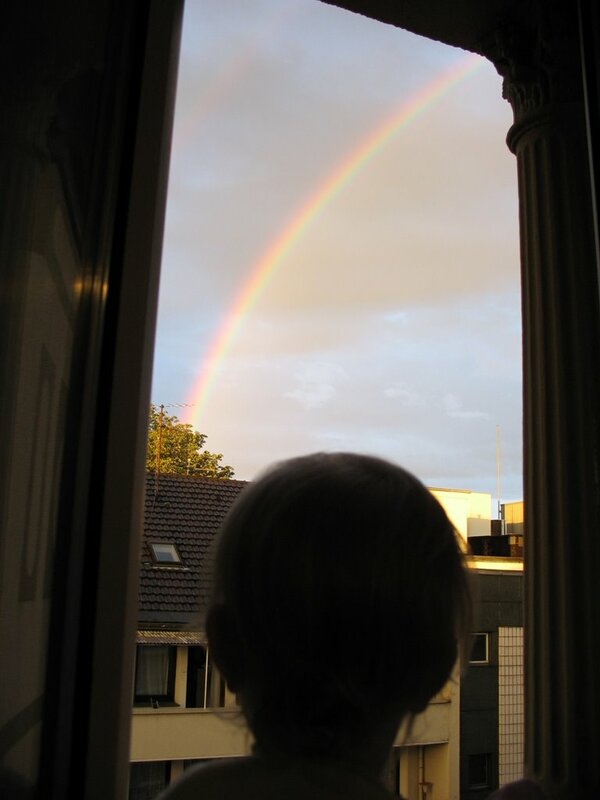 However, a new weather front moved in Sunday night, bringing with it much cooler weather, a brief rain shower, and a truly remarkable rainbow.